Andouille sausage is a smoked sausage that plays a significant role in Creole cuisine. It's made of pork, onions, garlic, pepper, seasonings, and wine. Not only does it seem fitting to be part of gumbo, but this smokey sausage is also delicious in a breakfast egg dish, flavorful stew, creamy soup, and a rich casserole. If you can't find smoked andouille sausage in your area, look for spicy Cajun-style sausage. Andouille sausage and shrimp make this wonderful gumbo hearty and delicious. 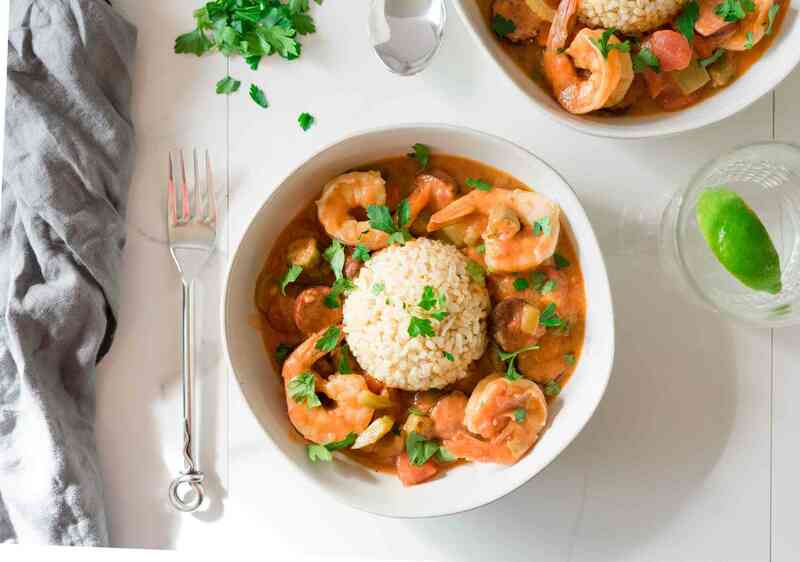 Chock full of vegetables, including the traditional okra, this gumbo takes on a nice shrimp flavor by adding them to the recipe early on. There are several steps to making this satisfying dish, but you will be pleased with its authentic taste. This creamy mushroom soup gets a little kick with the addition of andouille sausage. The sausage is cooked, and then the mushrooms are sauteed in the drippings, adding a bit of decadence to this dish. Cheddar cheese and heavy cream create richness, while garlic and green onion bring an extra layer of flavor. Butter beans are actually lima beans and a popular ingredient in the South. If you are not a fan of lima beans, don't pass by this recipe—the slow cooking makes the beans tender, and when combined with andouille sausage, take on delicious flavor. Perfect when served with warm cornbread. Pump up the flavor of regular old mac-n-cheese with the addition of andouille sausage, along with a bit of Cajun seasoning. Peppers, onions, and garlic add color, texture, and taste, and the wagon wheel noodles add a little playfulness to the dish. Like the essence of fall in a bowl, this stew combines delicious spicy sausage with butternut squash, apples, and sweet onions. Thick with three types of beans—baked beans, lima beans, and black beans— every spoonful of this hearty stew is sure to satisfy. Serve with cornbread or hot baked rolls for the perfect fall meal. Turn a side of cooked greens into a filling main dish with the addition of andouille sausage. The Cajun seasoning brings another level of spice, and the lemon juice and cherry tomatoes add the right amount of acidity. Serve with fresh coleslaw and warm cornbread. Start your day off with a kick with this egg casserole featuring andouille sausage and Creole seasoning. The sausage is cooked along with peppers and onions and layered on top of bread pieces with some chopped tomato; after a sprinkling of cheddar cheese, the egg and milk mixture is poured over, and the casserole is baked until puffed up and lightly browned. Fresh purple hull or black-eyed peas grow very well in the South, which is why they are a popular ingredient in Southern-style dishes. With just a few simple ingredients—peas, onion, garlic, chicken broth, and andouille sausage—you will have a filling and flavorful dish that is perfect as a hearty lunch or satisfying dinner. If you and your family are fans of mac-n-cheese and also love a smokey sausage, this casserole recipe is the perfect combination. The sausage is cooked along with bell pepper and onion and then is stirred together with a Creole-flavored cheese sauce and penne pasta. The casserole is topped with breadcrumbs and baked until bubbly. Bring a bit of zip to a cheesy potato gratin with andouille sausage, chopped pepper, and Cajun spices. A creamy cheese sauce is layered with cooked potatoes and the sausage and vegetable mixture to make a casserole that is ideal for a cold winter night. The andouille sausage adds just the right amount of interest to this kale and bean soup, and the onion, pepper, celery, carrot, and tomatoes round out the flavors and make the dish filling and nutritious. Serve with hot baked cornbread or warm crusty rolls. The touch of cream at the end makes this tasty soup thick and rich, the ideal lunch on a wintery day. Simple to make, onion, celery, and sausage are sauteed in butter until tender and browned, and then mixed with a bit of flour and green onion and herbs. This is simmered in chicken broth along with the potatoes and finished with the heavy cream. Spicy andouille sausage flavors this hearty soup that is studded with chopped jalapeno peppers and canned black beans. The beef broth and tomatoes create a rich base that complements the Cajun spice. Serve with freshly baked cornbread or crusty rolls for a fabulous lunch or dinner. As with all good, traditional gumbos, this recipe takes a bit of time—but once you taste it, you will see that the effort is worth it. The roux and the chicken can be made a day in advance if you like, leaving you to simply put together the gumbo and let it simmer before serving. Spoon over a mound of boiled rice.